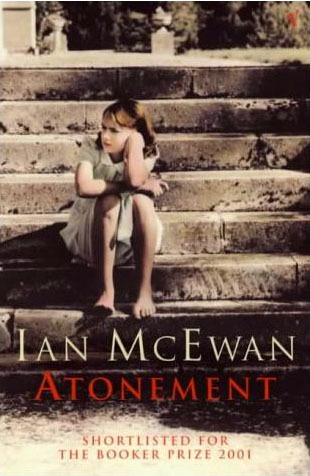 Ian McEwan’s Atonement is much more than just a novel. It is a supreme work of literature. With the ability to imbibe beautifully crafted sentences that convey a lot more than just a story, McEwan has demonstrated a unique and unparalleled talent to tell the story by laying stress on giving a convincing description of the thoughts of his characters. And so, as you savor one by one, the stream of the characters’ thoughts, it is not long before you realize that Atonement ceases to be just any other novel and instead, it assumes the shape of a delightful portrayal of psychological realism. The innocently dangerous thoughts of a 13 year old, the desperate battle for the will to survive amidst a war, the unreasonable demands and wishes of nine year olds, the tragedy of a hope, the reality of war, the desire to atone- all find a place in this magnificent meta-fictional novel. Atonement opens with Briony Tallis, a 13 year old aspiring writer, preparing a play to be performed on the occasion of her brother, Leon’s homecoming. There is an evident lack of focus in the opening pages, with the scenes largely drifting along Briony’s thoughts. It is however not long before all the characters are introduced and the book settles itself into a well crafted rhythm. But as soon as you expect events to unfold, McEwan makes it perfectly clear that he plans to tell the story through his characters’ thoughts rather than their actions. And so, every thought, every conscious and sub conscious occurrence is dealt with in the most satisfying and elaborate fashion. And so we are subjected to the day dreaming of a 13 year old Briony, the subtleties of whose response to an unfulfilled expectation is explored in magnificent detail. But perhaps, what is of even more significance and relevance is Briony’s dangerous illusion of having attained adolescence. And it is as a result of the dangerous presence of this illusion that she convinces herself that she has indeed understood the true meaning of the event she witnesses on the garden from her window. By nightfall the same day, she finds herself involved in more situations where circumstances demand her to construe with maturity, and which she consciously does, but alas, under just the delusion of the same. And the illusion of her attaining a greater sense of responsibility, manifesting itself in her imagination, culminates during the early hours of the following day, when she accuses Robbie, the house keeper’s son, of a crime he didn’t commit. This one act, arising out of her assuming superficial responsibility, haunts her eventually as she then decides to spend the rest of her life trying to atone for the same. McEwan’s attention to the conscious and the sub-conscious thoughts of his characters are portrayed in such convincing detail that he takes over 200 pages to describe the events of a single day. In it, we are subjected to Cecelia, Briony’s sister, and her unobtrusive lifestyle, having spent her entire college days in complete denial of her love to Robbie. And Robbie himself, who optimistically wishes to pursue a career in medicine, keeps his silence to himself and his thoughts from her. But how they let go of that unspoken and unacknowledged desire for each other in such an uninhibited manner, one night inside a library, is so beautifully described that even though the description goes into the minute details of their encounter, not at one moment, do you find the whole encounter offensive or objectionable. We also find Mrs. Tallis, the authority of the house, unwell as she usually finds herself to be, perceiving the actions of each and every person in her house through the walls of her bedroom. We meet Leon, Briony’s brother, and his friend Paul, the chocolate billionaire who are the guests for the night. Briony’s cousin Lola, who is a couple of years elder than Briony, also forms part of the homecoming celebration with her adolescent mindset, well set in. Once you go beyond that one fateful day, McEwan vehemently explores Robbie’s mind, as he reluctantly participates in a war filled with a reality that is dangerously unfamiliar to him. The delirious state of the military during the Dunkirk Retreat forms the backdrop of the surreal scenes of pain and hopelessness surrounding him as he walks miles and miles to the shore accompanied by a few of his buddies, with his only impetus for survival being the words that he carries on a sheet of paper in his breast pocket, Cecelia’s words : “I will wait for you. Come Back…” And amidst all the mind numbing tragedies around him, his only source of happiness and bliss, is his regular withdrawals from his memory bank- that one parting kiss that he shared with her just before he left for the war. The reason why this book captivates you is largely due to its ability to take the reader deep into the psyche of the characters and into what they are thinking. So much so, that the thoughts completely obviate the necessity of the actions. It also lies in the successful exploration of the concept of atonement- as seen through Briony’s voluntary effort to right what she wronged. Perhaps, a crucial scene in the book is one in which Briony is treating a young French soldier who is about to die. The French Soldier believes that she is his long lost love and continues to talk to her about the various things that he would do back home. And just before he dies in her arms, he calls out her name: “Tallis…..”, which Briony later realizes the difference in the way he said it. (“……She could still hear his voice, the way he said Tallis, turning it into a girl’s name…”) There are plenty more instances in the book which fill the reader with such a satisfied quality experience that it is difficult not to go through the last pages of the book filled with awe and wonder. One of the most compelling and satisfying reads ever. No wonder this book was chosen as one among the Times Best 100 Books. And no wonder it was made into an Oscar nominated movie by the same name. But no level of film making can get the beauty of the written words onto the screen. A must read for all book fanatics. This quote is in the first chapter itself. I think that quote comes very much in the beginning. Must be pages 13-14 (will probably depend upon the book). I think its just after Briony realizes that she wont be getting to play the lead in her play. So just look around very much in the beginning itself.